As you read and study about the Tabernacle, you definitely notice some parallels between it and the creation story. What was God doing, or trying to say to His created? First of all, in both stories God was creating a space where He could come and live with His creation. In both stories God came and met with them and walked with them in His created space. His desire from the beginning was to come and live with His chosen people. As God created the universe He divided into three sections; the visible Earth, the visible heavens, and the invisible heavens. He also divided the Tabernacle into three parts; the outer court, where ordinary people would be, the priest court, and the Holy of Holies, where God would be. You can definitely see the similarity in creation in that God would live in the invisible heavens, man would dwell on earth. The priests were a symbol of how man could get to the invisible places where God lives. When God created the universe, it took Him six days. On the seventh day He rested. Now compare that to the seven times in Exodus where it says. “The Lord said to Moses” (Exodus 25:1, 30:11, 30:17, 30:22, 30:34, 31:1, and 31:12). This equates with the seven times that God said “let there be” in Genesis. The seventh time God said. “Let there be”, the Scripture said. “He rested”. The seventh time” God said to Moses”, it was, don’t do any work on the Sabbath. Rest. (Exodus 31:12 and 13). The main job for the inhabitants of the Garden of Eden, was to work the land and take care of God’s home (see Genesis 2:15). The main job for the priest was to take care of all the furnishings and do the work in God’s new home. (Numbers 3:7-8). The entrance to the Garden of Eden was on the east. The entrance to the Tabernacle was also in the East. See Genesis 3:24 and (Exodus 26 process of deduction). 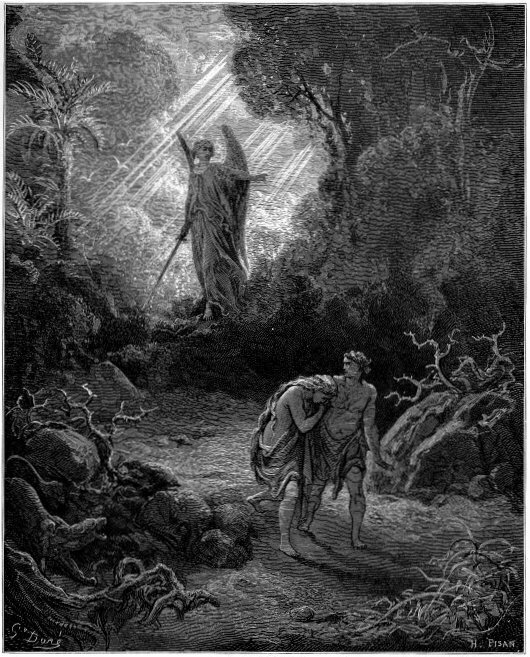 The entrance to the Garden of Eden was guarded by cherubim (Genesis 3:24). The entrance to the Tabernacle and the holy of holies were guarded by cherubim woven into the fabric. (Exodus 26:31-33). God placed a tree of life in the Garden of Eden (Genesis 2:9). When God had the Israelites craftsmen build the lamp stand or menorah, He had them build it to resemble and represent the tree of life, with buds, blossoms, branches, and fruit. (Exodus 25:31- 39). In Ezekiel 28:13, it lists the precious stones that were present in the Garden of Eden. These are the same stones that are worn by the priest in the Tabernacle (Exodus 28:17- 20), painting another picture and parallels of the 2 places. The complete Tabernacle was erected on the New Year’s day (Exodus 40:17), which signified a new era, a new beginning for God’s people. This mimics the creation story, which was, of course, the new beginning for mankind. God was saying in Genesis and Exodus ,”this is a new creation”. The Tabernacle is, in some many ways, the renewed version of the Garden of Eden. God was, again, trying to live with his people. Compare the Scriptures: Genesis 2:1 with Exodus 39:32. Both use similar language and say “all the work was completed”. Compare Genesis 1:31 with Exodus 39:43– both God and Moses saw what was done and said “it is good.” Compare Genesis 2:2 with Exodus 40:33. The Bible says in both verses, Moses and God “finished the work.” So much of the creation language is used again in the building of the Tabernacle. To summarize, when God had the Israelites construct the Tabernacle, He was re-creating something that was already in place in heaven. He was just making a smaller version of the furnishings in heaven. And the Tabernacle was also a re-creation of the events at the creation. God was starting over, in another attempt to dwell among his creation. God continued this theme with his final act to dwell among his creation when he sent his son Jesus to earth to dwell among men (John 1:14). Now He lives among us, in our hearts, instead of in a tent made by human hands. Amazing grace! Thank you for this article. I think the list of six times that God spoke to Moses should end with Exodus 31:1 instead of 31:12. Also, the line “God placed a tree of life in the Garden of Eden (Genesis 3:15- 18)” should read “God placed a tree of life in the Garden of Eden (Genesis 2:9)”. Thanks.